(PhysOrg.com) -- A biochemical analysis of a rare Clovis-era stone tool cache recently unearthed in the city limits of Boulder, Colo., indicates some of the implements were used to butcher ice-age camels and horses that roamed North America until their extinction about 13,000 years ago, according to a University of Colorado at Boulder study. The study is the first to identify protein residue from extinct camels on North American stone tools and only the second to identify horse protein residue on a Clovis-age tool, said CU-Boulder Anthropology Professor Douglas Bamforth, who led the study. The cache is one of only a handful of Clovis-age artifact caches that have been unearthed in North America, said Bamforth, who studies Paleoindian culture and tools. The Clovis culture is believed by many archaeologists to coincide with the time the first Americans arrived on the continent from Asia via the Bering Land Bridge about 13,000 to 13,500 years ago, Bamforth said. Named the Mahaffy Cache after Boulder resident and landowner Patrick Mahaffy, the collection is one of only two Clovis caches -- the other is from Washington state -- that have been analyzed for protein residue from ice-age mammals, said Bamforth. In addition to the camel and horse residue on the artifacts, a third item from the Mahaffy Cache is the first Clovis tool ever to test positive for sheep, and a fourth tested positive for bear. Dozens of species of North American mammals went extinct by the end of the Pleistocene, including American camels, American horses, woolly mammoth, dire wolves, short-faced bears, saber-toothed cats, woolly rhinos and giant ground sloths. While some scientists speculate ice-age mammals disappeared as a result of overhunting, climate change or even the explosion of a wayward asteroid, the reasons are still unresolved, Bamforth said. The Mahaffy Cache consists of 83 stone implements ranging from salad plate-sized, elegantly crafted bifacial knives and a unique tool resembling a double-bitted axe to small blades and flint scraps. Discovered in May 2008 by Brant Turney -- head of a landscaping crew working on the Mahaffy property -- the cache was unearthed with a shovel under about 18 inches of soil and was packed tightly into a hole about the size of a large shoebox. It appeared to have been untouched for thousands of years, Bamforth said. Although the surface of the house lot had been lowered by construction work over the years, an analysis of photos from the Mahaffy Cache excavation site by CU-Boulder geological sciences Emeritus Professor Peter Birkeland confirmed the approximate age of sediment layer containing the Clovis implements. The site appears to be on the edge of an ancient drainage that ran northeast from Boulder's foothills, said Bamforth. "The idea that these Clovis-age tools essentially fell out of someone's yard in Boulder is astonishing," he said. "But the evidence I've seen gives me no reason to believe the cache has been disturbed since the items were placed there for storage about 13,000 years ago." All 83 artifacts were shipped to the anthropology Professor Robert Yohe of the Laboratory of Archaeological Science at California State, Bakersfield for protein residue tests that were funded by Mahaffy. The protein residue on the artifacts was tested against various animal anti-sera, a procedure similar to standard allergy tests and which can narrow positive reactions down to specific mammalian families, but not to genera or species. While the quality and patterns on several of the artifacts resemble Clovis stonework, "It was the camel and horse protein results that were the clincher for me," said Bamforth. "We haven't had camels or horses around here since the late Pleistocene." The artifacts that showed animal protein residues were each tested three times to ensure accuracy. The artifacts were buried in a coarse, sandy sediment overlain by dark, clay-like soil and appear to have been cached on the edge of an ancient stream, said Bamforth. "It looks like someone gathered together some of their most spectacular tools and other ordinary scraps of potentially useful material and stuck them all into a small hole in the ground, fully expecting to come back at a later date and retrieve them." Bamforth said he knew immediately that much of the stone used to craft the tools in the cache originated from Colorado's Western Slope and perhaps as far north as southern Wyoming. The stone appears to have come from at least four distinct regions, including sites in Colorado's Middle Park south of Steamboat Springs, he said. Bamforth believes the type of people who buried the Mahaffy Cache "lived in small groups and forged relationships over large areas." "I'm skeptical that they wandered widely, and they may have been bound together by a larger human network." A single individual could have easily carried all of the Mahaffy Cache tools a significant distance, he said. One of the tools, a stunning, oval-shaped bifacial knife that had been sharpened all the way around, is almost exactly the same shape, size and width of an obsidian knife found in a Clovis cache known as the Fenn Cache from south of Yellowstone National Park, said Bamforth. "Except for the raw material, they are almost identical," he said. "I wouldn't stake my reputation on it, but I could almost imagine the same person making both tools." 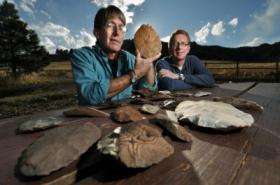 Climatic evidence indicates the Boulder area was cooler and wetter in the late Pleistocene and receding glaciers would have been prominent along the Front Range of Colorado, he said. "The kind of animals that were wandering around present-day Boulder at the end of the last ice age -- elephants, camels, huge bears and ground sloths -- are creatures we would expect to see in a zoo today." A 2008 study led by the University of Oregon offers evidence that a cadre of comets exploded over North America about 12,900 years ago, triggering massive fires that caused the extinction of ice-age mammals and perhaps even the Clovis people. The evidence is based on a thin layer of microscopic diamonds found in ancient soil layers that could only have been created by searing heat and pressure transforming carbon on Earth's surface. Mahaffy, who initially thought the stone tools were just a few hundred years old, called the CU-Boulder anthropology department the day of the discovery, and Bamforth came to the examine the cache the following day. "I think it's safe to say Doug got pretty excited based on his background and knowledge of the area," said Mahaffy, a Boulder biotechnology entrepreneur. The high-tech tests that confirmed the antiquity of the tools "are a nice marriage between modern biotechnology and anthropology," Mahaffy said. "There is a magic to these artifacts," said Mahaffy. "One of the things you don't get from just looking at them is how incredible they feel in your hand --they are almost ergonomically perfect and you can feel how they were used. It is a wonderful connection to the people who shared this same land a long, long time ago." Mahaffy said the artifacts will likely wind up in a museum except for a few of the smaller pieces, which will be reburied at the cache site. Spot the homeschooledboy mistake, the world didn't even exist 13,000 tears ago. the earth is over 4 billion years old...with that being said I'm going to take a wild guess and say it was here 13,000 years ago...unless it decided to go on vacation? Unlike dinosaur bones, Christian fundamentalists were put on earth 6000 years ago by the devil to fool us and test our faith. The same 'tools' are found all over in montana. The stone making technology of the Clovis culture was most likely introduced to North America by migrants from Europe migrating along the edge of the polar ice cap during the ice age. It bears little similarity to the eastern Asian stone working of the time but a strong similarity to that of Europe.